I took Monday off because I missed my Color Theory Class earlier in the month because of a work conflict. It was nearly 80° so it was a pretty great day to have off. The class was from 10-1, and was at a different quilt store, Wooden Spools, than the one I usually attend, but same teacher, and they are at the same place in their schedule. Different ladies in the class, ha ha ha, like new victims, but I didn’t have as much back story to tell with this quilt as I usually do, so they lucked out. 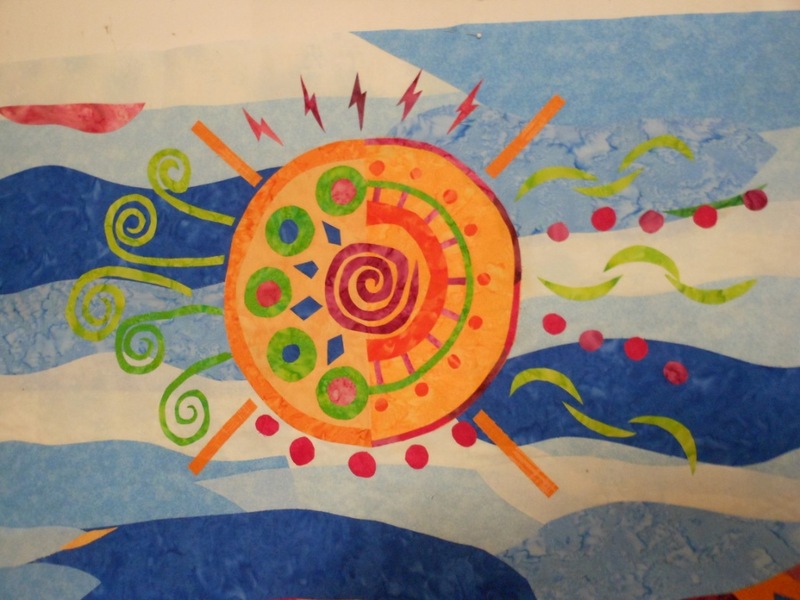 The way the class works is that everyone displays their quilt or weaving or painting that they made since the last month that fits with the color theme we are learning about – this month it was the tetrad – four colors equidistant from each other on the color wheel. 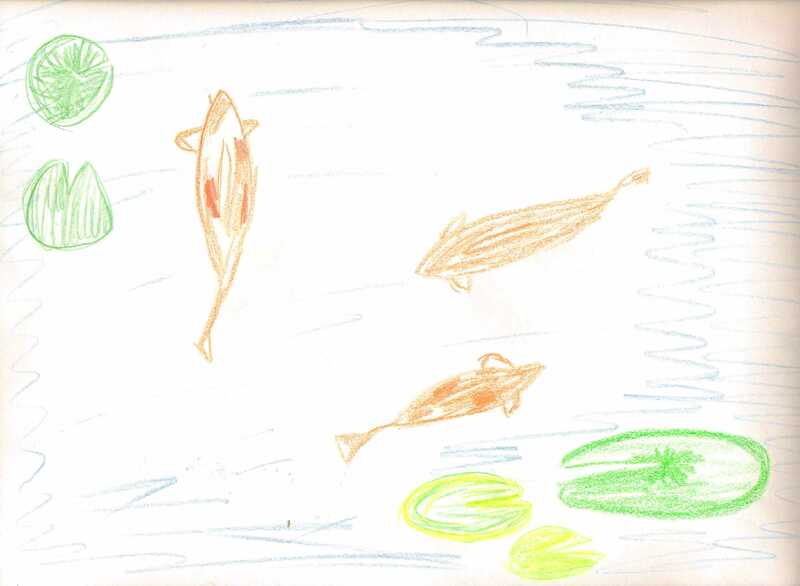 I chose blue, orange, red-violet and yellow-green, and so did most of the class. There were, as always, a very wide variety of designs and ideas. I lost my mind and made this quilt about 35″ by 50″. What was I thinking? But I am happy with the way it turned out. It is not quilted yet but it is fully assembled and fused together. I got some hints on a few finishing touches and how to quilt it and finish it from my teacher and classmates. The sun is my favorite, of course. After everyone has shown their quilt and we have all commented and asked questions, then our instructor lectures about the next quilt and shows examples. In this case, the next quilt is supposed to use color to show light or luminosity. 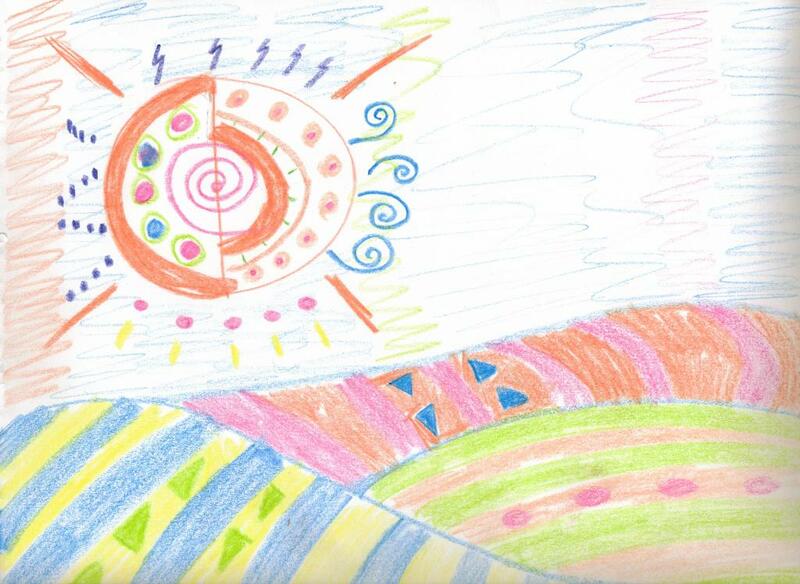 It should look like light is shining from within, or shining on, or around the subject or part of the quilt. I have a week and half to get this quilt done, because I did want to wait until I heard the lecture, so I will be making a SMALL quilt. 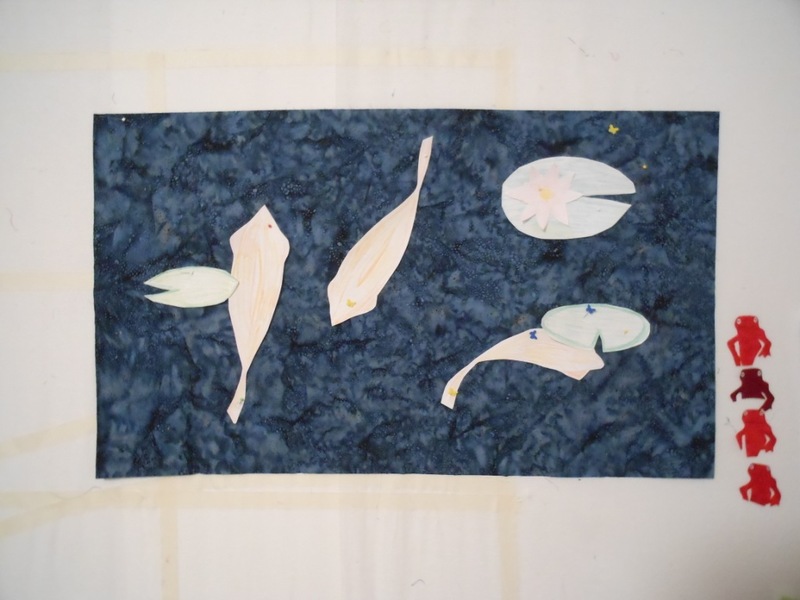 And I think I am going to do koi and water lilies, with the dark water as the contrast. After my class, I went to Golden for lunch and to buy materials for the next quilt, but I think I will include that lunch report tomorrow! Here are a couple of my sketches. After working on these, I had to go out and buy a new box of crayons, because the ones I have are very disappointing.Nothing like a new box of crayons! I am well aware those lily pads look kind of like giant Pac Man monsters ready to chomp on my fish. I put some fabric up on the wall and started cutting out patterns. 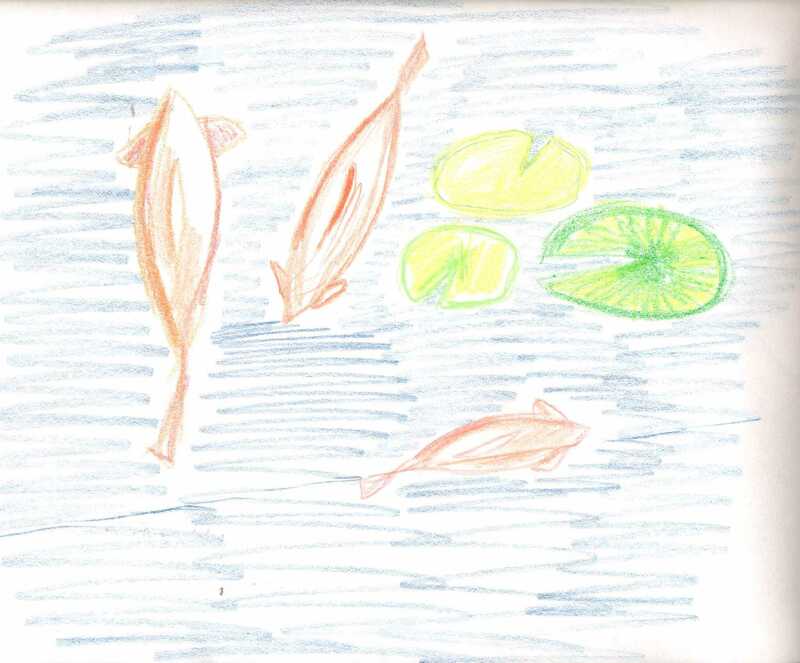 (These are not the true colors of the fish/lily pads). I really like this layout the best, but the fish and the lily pads are not interacting with each other at all. I just don’t like this as much for some reason. I am not wild about this one either. Maybe the lily pads need to be bigger. Maybe the blue piece needs to be less wide, because I just slapped a piece that was a handy size up there. I need to decide, and get to quilting, because my class is one week from last night! It sounds like it might rain this weekend, which would be good, because then I wouldn’t feel like I should be working in the yard, and I could work on this piece. 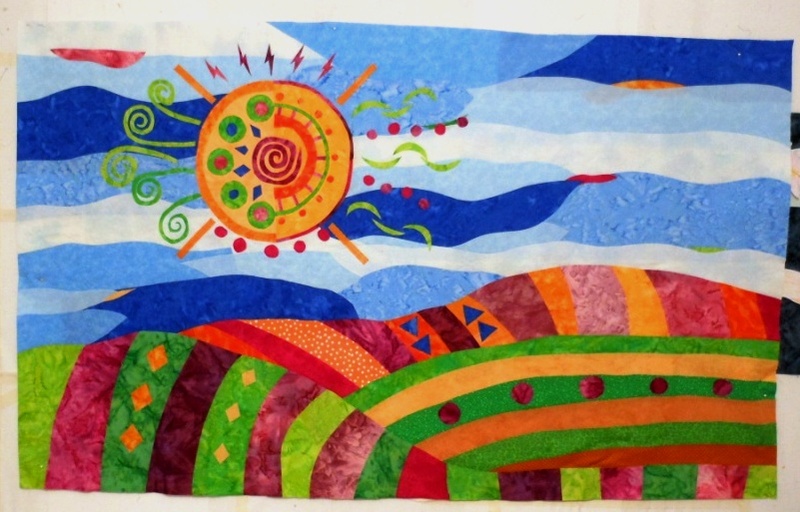 This entry was posted in Art, Quilting and tagged color, quilting by glenderella. Bookmark the permalink. Dang it!! 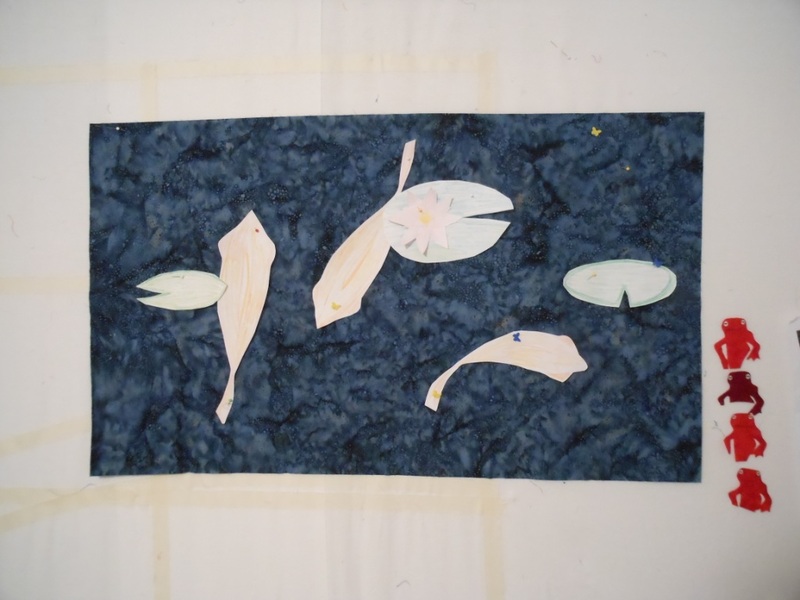 I was going to do a goldfish in water quilt for my next month quilt project. Gaaaarrrr!!! Please don’t think I copied you. I’ve been planning this one since I got my color wheel. Oh and “How YOU doin?” to the Newts. Your color quilts are quite impressive. I would have a lousy time if I took a class like that. Of course, I would not (at least now) take a quilt class. And I avoid color design in weaving – plain jane weaving for me! This is going to be a really, really cool quilt! I might like it more than the bat quilt! Well, I was surprised to find this while I was “out there” searching Luminoisity. My Prayer Flags did not “cut” it. I love your sun and the way you approach your work. I will miss May class. Hi Gayle! 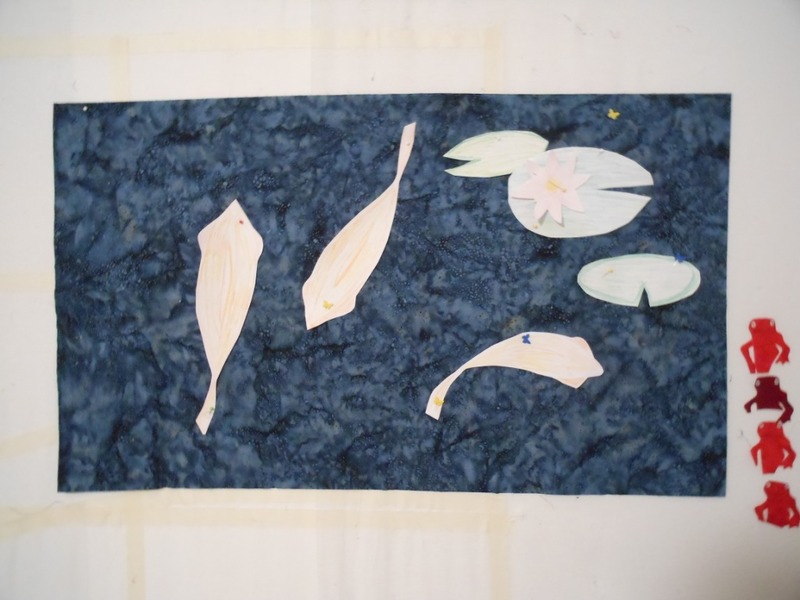 I am working on the koi now, I just painted one with the oil paint sticks (and now I have oil paint on my iron, these things happen with me….) I need to get going if I am going to get this done my next Weds. I am trying!